Horseshoe Magnets are made of Alnico, a non-corrosive magnet able to withstand extremely high temperatures. These magnets are created from aluminium, nickel and cobalt, hence the name: Alnico! 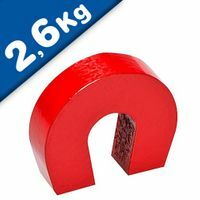 While Alnico magnets are weaker compared to Neodymium and Ferrite magnets, they are less fragile and therefore more durable than the others. 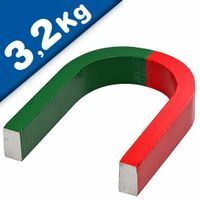 Alnico magnets, when shaped like a horseshoe, are very popular with schools and science departments as they can be used to demonstrate magnetic fields and properties. 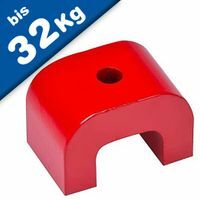 Buy Horseshoe Magnets from Magnosphere a leading supplier! 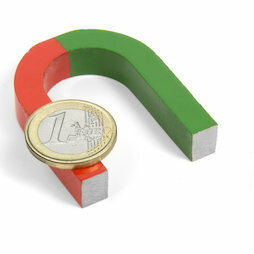 Horseshoe Magnets are regarded as the most quintessential magnet available and are recognised as the universal symbol for magnets and magnetism. Our handy horseshoe magnets are strong and versatile. They have a maximum operating temperature of 500⁰C. These magnets are perfect for teaching environments when learning about magnetism and the north and south magnetic properties, since both ends are clearly labelled as such. The north and south poles are always shown in different colours or stamped white on a red background. The material composition is normally Alnico although sometimes horseshoe magnets are made of ferrite material. 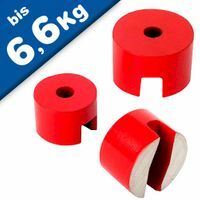 Buy Alnico horseshoe magnets at Magnosphere and get a better deal!